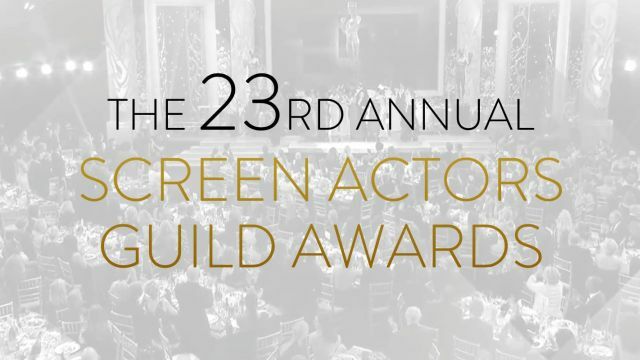 Nominees for the 23rd Annual Screen Actors Guild Awards for outstanding individual, cast and ensemble performances in film and television of 2016, as well as the nominees for outstanding action performances by film and television stunt ensembles were announced this morning at the Pacific Design Center’s SilverScreen Theater in West Hollywood. SAG-AFTRA Executive Vice President Gabrielle Carteris introduced Sophia Bush (Chicago P.D., One Tree Hill) and Common (Suicide Squad, Selma), who announced the nominees for this year’s Actors live. Prior to that, SAG Awards Committee Chair JoBeth Williams and Committee Member Jason George announced the stunt ensemble nominees during a live webcast. The 23rd Annual Screen Actors Guild Awards presented by SAG-AFTRA with Screen Actors Guild Awards, LLC will be produced by Avalon Harbor Entertainment. Inc. and will be simulcast live on TNT and TBS on Sunday, January 29, 2017 at 8 p.m. (ET) / 5 p.m. (PT). The SAG Awards was the first televised awards show to acknowledge the work of union members and the first to present awards to motion picture casts and television ensembles. Prior to the televised ceremony, the stunt ensemble honorees will be announced from the red carpet during the SAG Awards Red Carpet Pre-Show.